A rapid, accurate diagnosis is always the goal when dealing with cancer. It is particularly important for lung cancer, which is the leading cause of cancer deaths. Cancerous nodules in the lungs can be small and in hard-to-reach areas, making biopsies difficult and delaying diagnosis. A new robotic bronchoscopy platform is changing that. It allows our pulmonologists to more clearly see and reach lung nodules without invasive surgery. Fox Chase Cancer Center is one of the first hospitals in the U.S. to use this advanced tool. 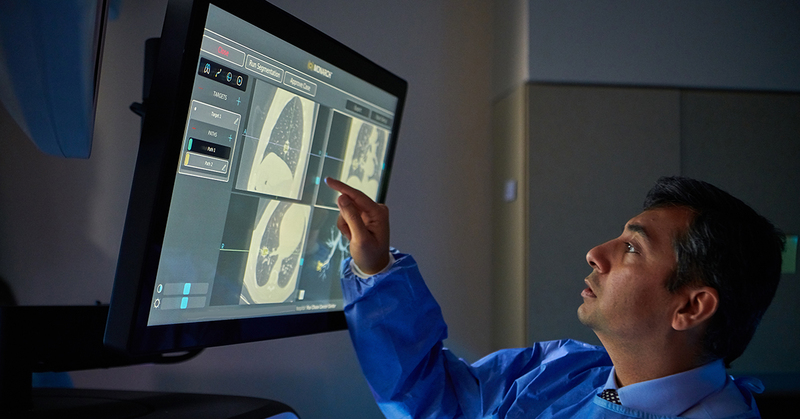 “It allows us to reach places we never could before—it is a leap forward,” Alan Haber, MD, FCCP, Chief of the Section of Pulmonary at Fox Chase Cancer Center. Bronchoscopy is a method for looking inside the lungs and detecting disease. It involves inserting a tube called an endoscope—with a light and camera attached to it—through the nose or mouth, down the throat, and into the lungs. Doctors can take samples of tissue or mucus for testing in a laboratory. Robotic-assisted bronchoscopy involves a similar procedure except that the tube and camera are attached to robotic arms, which are precisely controlled by a highly-trained specialist, like Manley. A hand-held controller is used to direct a small, flexible endoscope into the lung using computer-assisted navigation. The camera allows the physician to view a magnified image of the lung during the procedure, and the views are based on 3-D models of the patient’s own lung anatomy. It’s an improved version of a tool that helps save lives. The robotic bronchoscope is helping doctors at Fox Chase deliver a diagnosis more quickly. The robotic bronchoscope is the latest in a series of significant improvements in the diagnosis of lung nodules. Over the last 15 years, there have been many advances in the noninvasive techniques doctors use to diagnose lung cancer, Manley said. “For instance, we now travel through the airways to do biopsies instead of doing surgery to reach the lungs, Manley said.” Being able to navigate airways routinely and safely and get answers quickly and accurately is important. And it’s why Fox Chase works to employ the latest technology for detecting the disease. Learn more about lung nodule diagnosis at Fox Chase.